20 years | Voices Of Birralee – Blog! Rehearsals are underway, the program is being printed and tickets are selling well for our 20th Anniversary Concert on Sunday 1 November! We thought this blog would feature a Q&A with one of our longstanding singers, Sarah McDonald, while announcing our alumni soloist and singers joining us for this exciting celebration! It’s been a fantastic opportunity to connect with our alumni for this event, and because of this wonderful experience and knowing the expertise and value our alumni have to offer, we have decided to launch the Voices of Birralee Alumni Alliance! This will enable us to work with our alumni in the future, continuing to enhance the strength of the Birralee community. Those interested can register and find out more here. Sarah McDonald has been with Voices of Birralee for 20 years and is currently with the Resonance of Birralee ensemble. Let’s find out about Sarah’s experience. When and why did you join Birralee? I joined Birralee at the beginning in 1995. 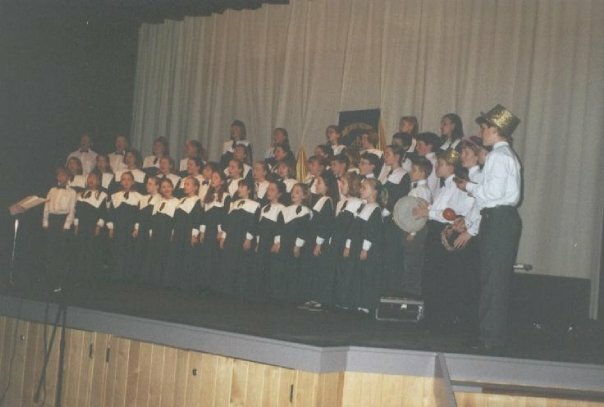 I was eight years old and went into the Piccolos or Junior choir – I can’t remember if we had Piccolos in the beginning! Both of my brothers also joined, aged six and 10 years old because Mum wanted us to do some more singing. Julie already took all of the choirs at The Gap State School, the primary school we attended, so it was an easy choice. I seem to remember the first Westside Youth Choir having lots of The Gap State School kids in it. 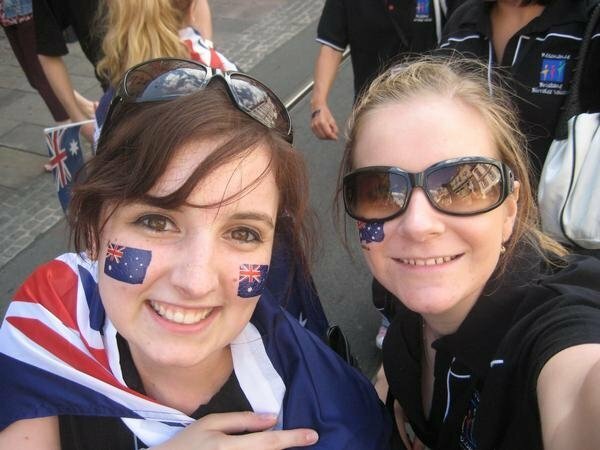 Sarah McDonald with fellow chorister Pip Thomson at the World Choir Games, Graz, 2008. Standout conductor for you over the years? I think it would be harder to argue who hasn’t influenced me over the years at Birralee. In more recent times (although I don’t know if you can call almost 10 years recent), I’ve had the pleasure of singing in a choir with Paul Holley at the helm and Brendan Murtagh at the piano. These men share their immense talent with so many of us each week and aside from continuing to develop my singing, I’ve been able to witness a strong and effective working relationship which allows both to make the most of their talents. It’s like having free PD (personal development) sessions each week with tricks of the trade that I can use for my own choirs! Justine Favell has always been there at the piano supporting our learning, and I have enjoyed many concerts and CD recordings by her side as a page turner when I wasn’t performing. Justine always passed on good advice which resulted in an extended period in my life (around 12 years) of accompanying school and community choirs across Brisbane. This is something that I still do and am very aware of times that I do or play things in rehearsal just like Justine would! Julie Christiansen OAM has been there throughout my entire Birralee journey, shaping and developing my love of quality choral music. She gave me countless singing opportunities and inadvertently showed me how to select the best choral music available. Birralee is known for the wide and varied range of repertoire we sing and that all comes down to expectations that Julie set up many years ago. In addition to this, she opened up new pathways for me to explore. I started accompanying the Piccolos when I was 14 and a half which grew into accompanying (over the years) Piccolos, Juniors and Singers. I was also encouraged to help out in the Birralee office which increased my arts administration skill base and a thorough understanding of tour and event management. The opportunities and experiences that have been afforded to me by Julie alone, are extensive and life changing to say the least. There are few words worthy enough of describing how thankful I am to Julie for all that she’s done for me. The entire Birralee experience has really helped me get to where I am now as Assistant Head of Year at Brisbane Grammar School where I teach Middle School Music and Drama – two performance based subjects. I also conduct and accompany choirs at the school as well as directing plays and musicals. Exploring Europe at the World Choir Games, 2008. What are you highlights? 20 years is a long time to pick one particular highlight for. I think the main thing to pick up on would be that Birralee is always great fun. We’ve done many overseas tours which are always exciting, but who knows if they will ever beat the road trips to Newcastle (2003) or Sydney (2007)? Any experience with Birralee is an opportunity to do what you love with people you love to be around. The strongest of friendships have been forged for me from my ‘Birralee friends’ – people who I probably would not have met otherwise. Favourite songs over the years? Jingle-bell Fantasy! Julie is still convinced that we did this at school and not Birralee but I’m sure we did it one Christmas – best song ever! Along with everything else we do. The quality of music sung by choristers in Birralee is what helps to make it so great. I could name many pieces like Labour of Love, Ain’t No Grave, Skorokoro, I Carry Your Heart, Birdland, Ecce Dedi, Jing-ga-lye-ya, Ach! Synku Synku, Magosh a Rutafa III, Living in a Holy City, Vus Vet Zayn… The list goes on!!! Celebrating our alumni! Our concert on 1 November will feature former Birralee soprano, Ashleigh Maclaine (nee Crane) who will be featured as a soloist. Then: Ashleigh Maclaine when she sang with Voices of Birralee in 2007. Ashleigh’s career has taken her to great heights including performing with Opera Q, the Underground Opera Company and in a number of highly reputable performances. She began studying music at the University of Queensland in 2007 under the tutelage of Joseph Ward, OBE, and graduated in 2010 under Sarah Crane at the top of her cohort for performance. 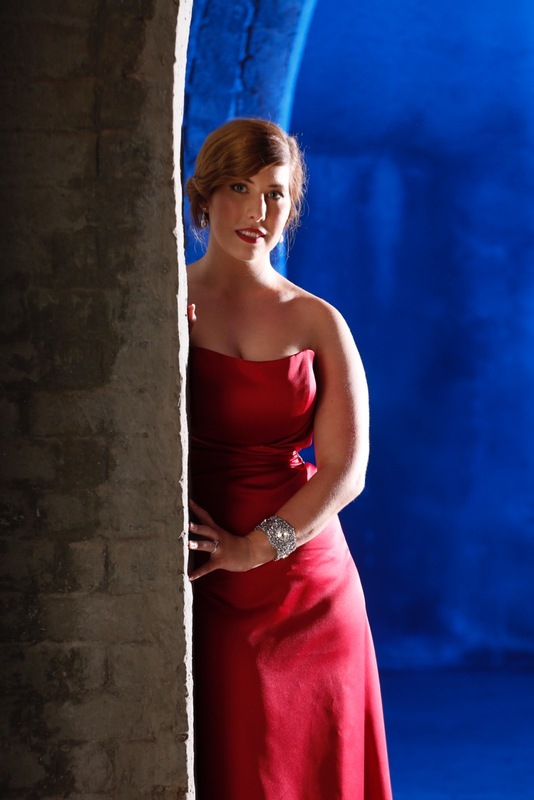 She furthered her studies with Margaret Schindler at the Queensland Conservatorium of Music, graduating from the Masters in Opera Studies in 2013. Here, she covered the role of Anne Trulove in Stravinsky’s The Rake’s Progress in 2012 and sang the role of Susanna in Mozart’s Le Nozze di Figaro in 2013. Ashleigh received the Doreen Ord Scholarship Award in 2013, and in 2014 she went on to win first prize in the Operatic Aria section of the Queensland Performing Arts Competition. Ashleigh is a founding member of Outcast Theatre Company as of 2010 and has continued working with the aspiring company in many of their productions and installation pieces. In 2013 she made her debut with Opera Q in Bach’s St Matthew Passion and went on to perform in the 2014 production of The Perfect American as part of Brisbane Festival. She has continued her work with Opera Q singing the role of Adina in touring production of FiZZ!, an adaptation of Donizetti’s L’elisir d’amore, and earlier this year singing the role of Rosina in the touring production of The Adventures of Figaro, an abridged version of Rossini’s Il Barbiere di Siviglia. Now: Ashleigh Maclaine as she gets ready for a performance with the Underground Opera Company at the Spring Hill Reservoir in November 2015. Stay up-to-date with Birralee via our Facebook page and for more information visit our website. Have you purchased your tickets yet for our 20th Anniversary Concert at QPAC’s Concert Hall on 1 November? Make sure you get to it with tickets selling fast! These can be purchased at QPAC. This entry was posted in Reflections and tagged 20 years, choir, Choral, choristers, reflection, singing, Voices of Birralee on October 22, 2015 by Voices of Birralee.